Select an authority and a school from the drop down lists to see its current status. Select an authority and a school from the drop down lists on the left to see its current status. Please use the drop down lists on the left side of this page to select your child's school and see its status. You can select multiple schools. Parents with USO accounts can log in and their selected school(s) will be remembered every time they log into the website eliminating the need to perform a search. Parent USO accounts may have been obtained via the eAdmissions application process, registering for a school shop or registering for online reporting. 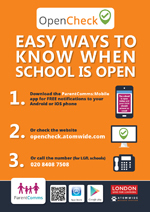 If the school you are interested in is not currently using the system, or keeping it updated, then please draw this website to the attention of the Head Teacher. To use the telephone service available to London Grid for Learning schools, please call 020 8408 7508 and enter the school's seven-digit DFE code. OpenCheck for Schools: System administrators can log in using the link in the black bar, to update the school status in the messages visible for their school. If you are a member of staff at a school not using USO and would like to make use of this free service please click here to apply online for an account. *Using the mobile app may incur data charges from your network provider.